KABUL, Afghanistan -- Since the International Criminal Court began collecting material three months ago for a possible war crimes case involving Afghanistan, it has gotten a staggering 1.17 million statements from Afghans who say they were victims. The statements include accounts of alleged atrocities not only by groups like the Taliban and the Islamic State of Iraq and Syria (ISIS), but also involving Afghan Security Forces and government-affiliated warlords, the U.S.-led coalition, and foreign and domestic spy agencies, said Abdul Wadood Pedram of the Human Rights and Eradication of Violence Organization. Based in part on the many statements, ICC judges in The Hague would then have to decide whether to seek a war crimes investigation. It's uncertain when that decision will be made. The statements were collected between Nov. 20, 2017, and Jan. 31, 2018, by organizations based in Europe and Afghanistan and sent to the ICC, Pedram said. Because one statement might include multiple victims and one organization might represent thousands of victim statements, the number of Afghans seeking justice from the ICC could be several million. "It is shocking there are so many," Pedram said, noting that in some instances, whole villages were represented. "It shows how the justice system in Afghanistan is not bringing justice for the victims and their families." The ICC did not give details about the victims or those providing the information. "I have the names of the organizations, but because of the security issues, we don't want to name them because they will be targeted," said Pedram, whose group is based in Kabul. 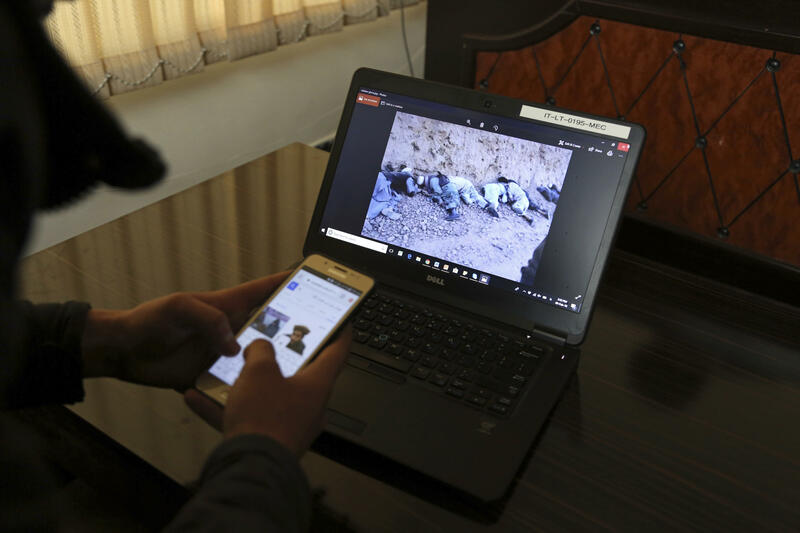 Many of the representations include statements involving multiple victims, which could be the result of suicide bombings, targeted killings or airstrikes, he said. Among those alleging war crimes is a man who asked The Associated Press to be identified only by his first name, Shoaib, because he fears for his safety. Shoaib said his father, Naimatullah, was on a bus in Dawalat Yar district in Afghanistan's central Ghor Province in 2014 when a band of gunmen stopped it and two other buses, forced the passengers off and told them to hand over their identity cards. The 14 Shiites among them were separated from the rest and killed, one by one, he said. The slayings outraged the country. A Taliban commander was soon arrested and brought before the media, but no news about a trial or punishment was ever reported, said Shoaib, who is in his 20s. Displaying a photo of the man he believes killed his father, Shoaib said he doesn't go to the authorities for information about the incident because the commander had connections with the police and the local government administration. "Please don't say where I live, or show my face," he implored a reporter. "What if they find me? There is no protection in Afghanistan," he said. "Everybody knows that they have connection in the government," he added. "I think in Afghanistan, if you have money, then you can give it to anyone, anywhere, to do anything." Several powerful warlords, many of whom came to power after the collapse of the Taliban in 2001 following the U.S.-led intervention, are among those alleged to have carried out war crimes, said Pedram, who also is cautious about releasing any names. After receiving death threats last year, Pedram fled Kabul briefly and now keeps a lower profile, no longer speaking to local media. "The warlords are all here. You have to be very careful," he said. "In the morning, I kiss my little son goodbye, I kiss my wife goodbye because I don't know what will happen to me and when, or if I will see them again." Established in 2002, the ICC is the world's first permanent court set up to prosecute war crimes, crimes against humanity and genocide. The ICC can only investigate any crimes in Afghanistan after May 2003, when the country ratified the Rome Statute, the treaty that established the court. Former President Bill Clinton signed the treaty, but President George W. Bush renounced the signature, citing fears that Americans would be unfairly prosecuted for political reasons. In November, when ICC prosecutor Fatou Bensouda sought judicial authorization to begin the investigation, she said the court had been looking into possible war crimes in Afghanistan since 2006. Bensouda said in November that "there is a reasonable basis to believe" that crimes against humanity and war crimes were committed by the Taliban as well as the Haqqani network. She also said there was evidence that the Afghan National Security Forces, Afghan National Police and its spy agency, known as the NDS, committed war crimes. Bensouda also said evidence existed of war crimes committed "by members of the United States armed forces on the territory of Afghanistan, and by members of the U.S. Central Intelligence Agency (CIA) in secret detention facilities in Afghanistan," as well as in countries that had signed on to the Rome Statute. The secret detention facilities were operated mostly between 2003 and 2004, she said. It was the first time that Bensouda has targeted Americans for alleged war crimes. Bensouda said an investigation under the auspices of the international tribunal could break through what she called "near total impunity" in Afghanistan. The prosecutor's formal application to the court set up a possible showdown with Washington. While the U.S. is not a member state of the ICC, its citizens can be charged with crimes committed in countries that are members. At the time of Bensouda's announcement, a Pentagon spokesman said the U.S. Defense Department does not accept that such an investigation of U.S. personnel is warranted. The U.S. State Department has said it opposes the court's involvement in Afghanistan. Another Afghan who went to the ICC is Hussain Razaee, whose fiancee, Najiba was among 30 people killed in July when a Taliban suicide attacker rammed a car bomb into a bus carrying employees from the Ministry of Mines. For months, Razaee said he contemplated suicide. He had spent two years convincing Najiba's parents to allow them to marry, and they had finally agreed. Unlike most Afghan couples, theirs was not to be an arranged marriage. "I lost the person I loved," he said. Razaee said he went to the ICC because he wants those responsible to be punished, even if a peace deal with the Taliban is reached. "I am pursuing this because I want the ICC to record these cases so that if there is a peace agreement, the Taliban leaders will be required to identify the people behind the killings," Razaee said. "I don't trust the international community to bring any of these warlords or Taliban to justice, but if an international legal body rules according to the law, then the government could be forced to enforce it," he said.